EDCer. Licensed unicorn hunter. We've got pockets, so they might as well be filled with awesome stuff. I sharpen and service folding and fixed-blade knives. Please see the blog post titled "EverydayArsenal Knife Services Information" to find out more, and find the Facebook page as well! Carry on! 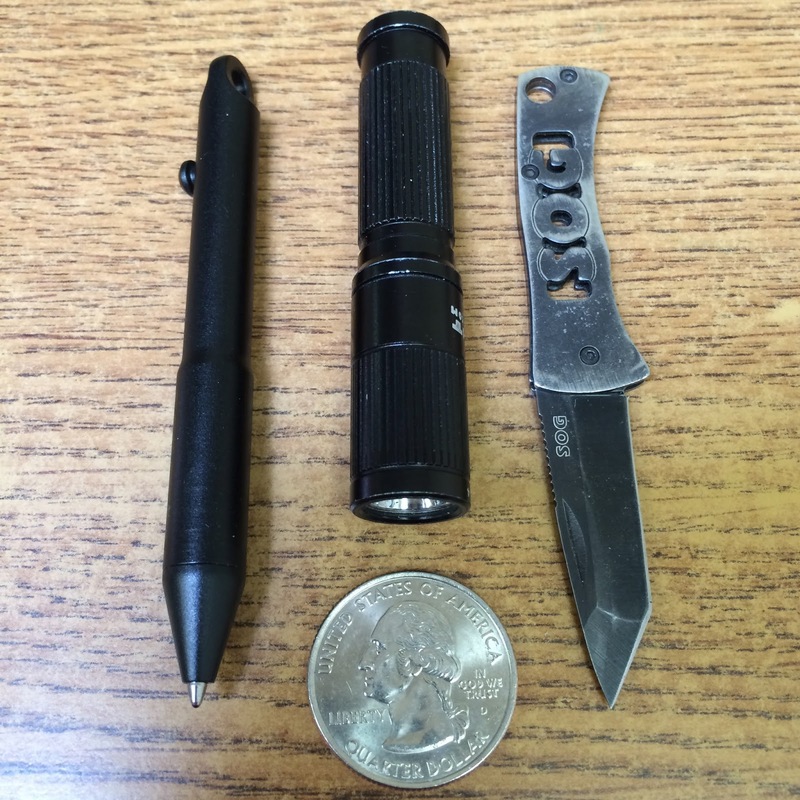 There is an eternal march toward more useful and more durable EDC (Every Day Carry) items. 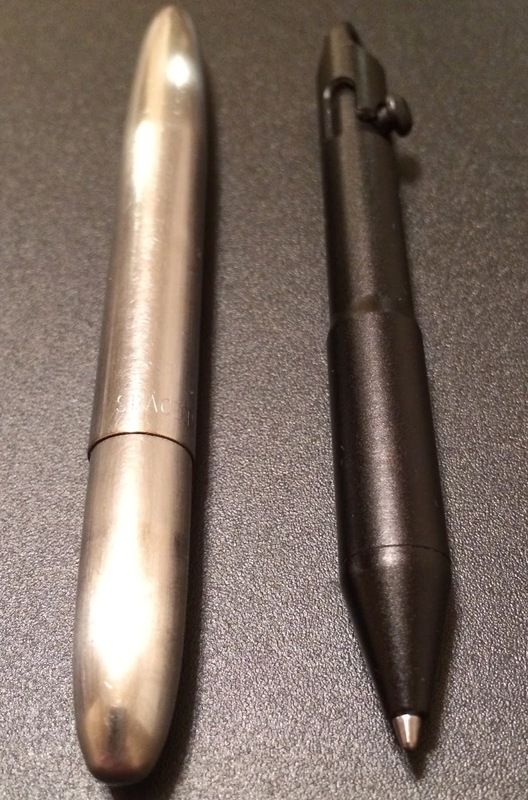 One of the more recent items to appear on that march is the Move, a miniature bolt-action pen that runs on the Lamy M22 ink refill. And by "miniature," I do mean small. 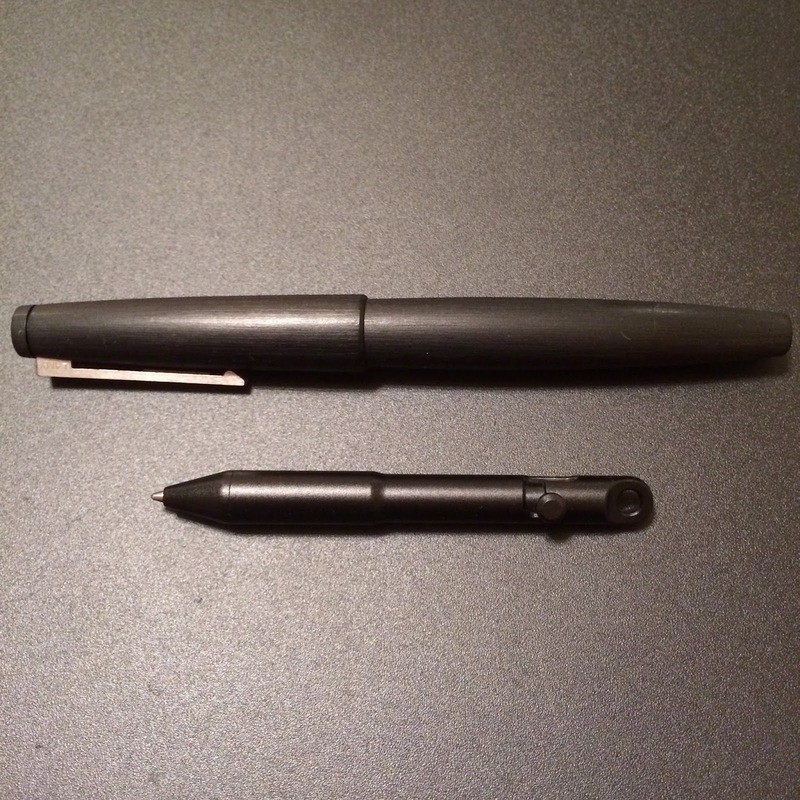 It's even smaller than the standard Fisher Space Pen when the pen is capped. 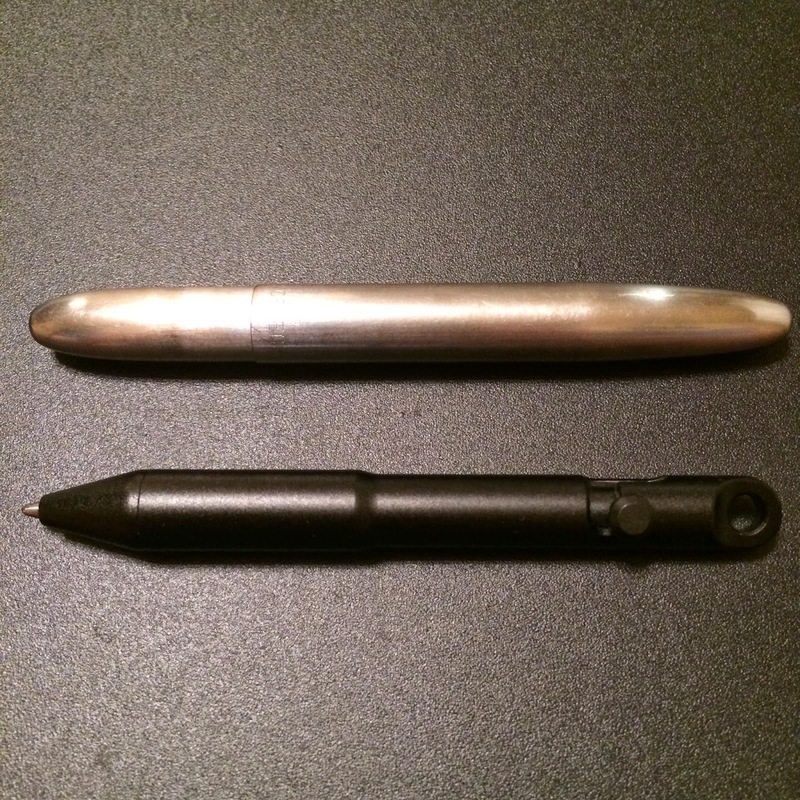 Oliver Sha (link to his Kickstarter campaign page here) set out to make a small, lightweight, rugged, keychain-compatible, capless EDC pen. I put $52 behind Oliver's project, and I'm glad I did. I wasn't initially sure what I was going to do with this pen once I had it, but I was a little Kickstarter-happy at the moment and it looked like a unique project (plus I've always been a sucker for miniature things). Now that I've had the pen a few days, I suspect will be using the pen quite a bit more than I expected. And the finish thus far seems as though it will hold up pretty well. Let me say this early on though: if you have large hands, you're wasting your time. I have medium hands and I can just barely use the Move with relative comfort (although it still may work for jotting an occasional quick notes even with large hands). At first glance, this doesn't even look like a pen. It just looks like a little black metal...thingy. A nose picker, maybe; or a not-so-tactical pokey stick. It's quite skinny, but thicker at the grip section (which is good because otherwise this thing would be just about downright impossible to use). This is one point where I think there could have been a design improvement. Rather than leaving the grip slick, machining a series of grooves or a spiral along the grip would made this pen go from not-very-grippy-especially-if-your-hands-are-bone-dry to pretty-stinkin'-grippy-regardless. I suspect this wouldn't have affected production costs much and would go a long way toward making the Move more usable (maybe a second version could arrive on scene later?). 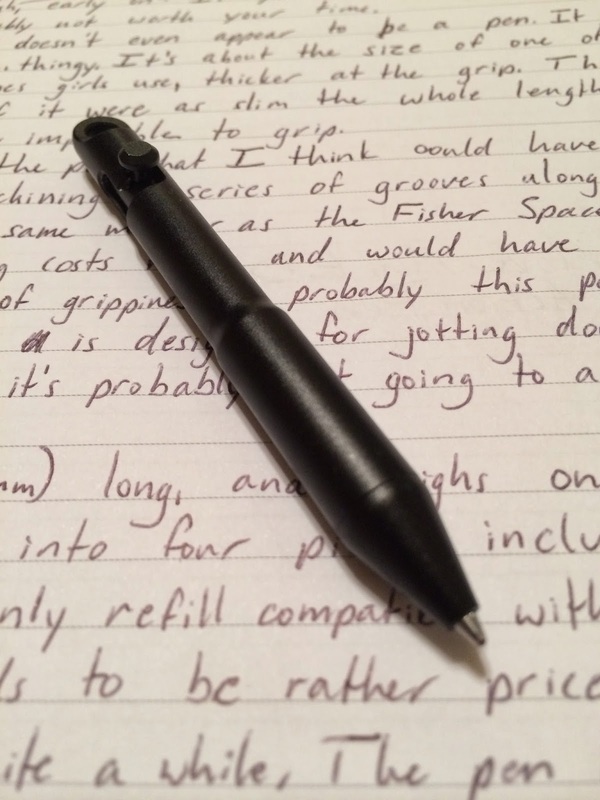 However, considering that this pen is designed to sit unobtrusively in your pocket or purse until you need it for a quick note rather than for writing a treatise on war and politics, this probably isn't a deal breaker for most people though it probably would be for some. 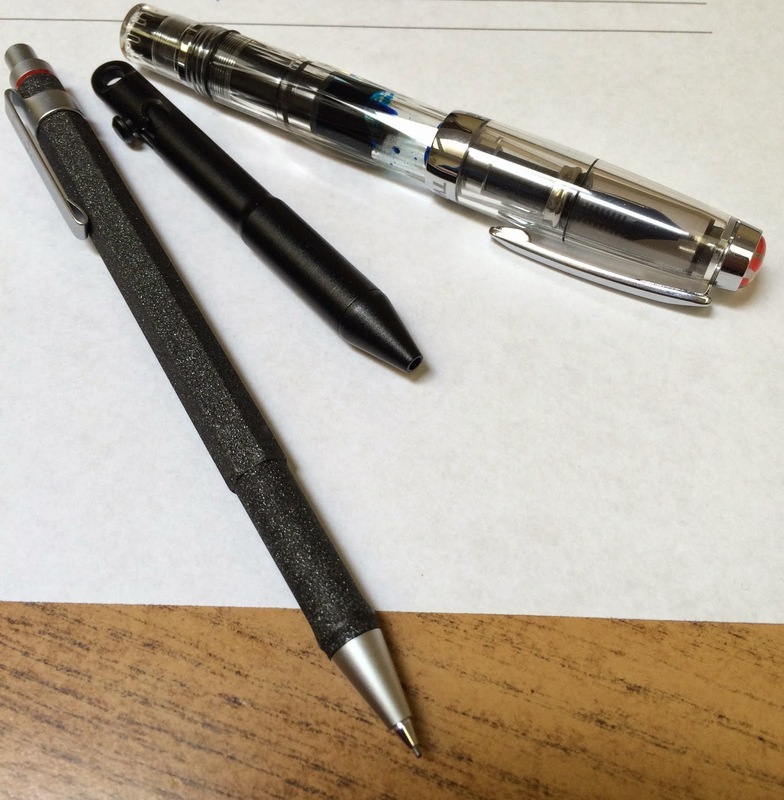 A rOtring Lava, Move, and TWSBI Mini sandwich. The Move, which is machined from hard-anodized 6061-T6 aluminum alloy, is only 3.3 inches (83mm) long and weighs a mere 0.36 ounces (10.3g): although I'm not sure if that is with or without an ink refill in it. The ink refill weighs maybe a fifth of an ounce, so it probably doesn't really matter. 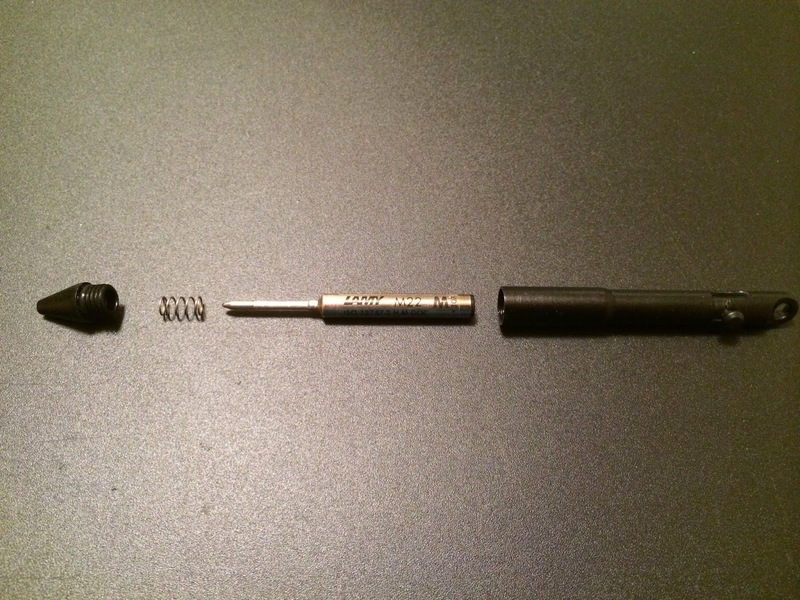 It disassembles into four parts: including the body, the refill, the spring, and the tip. 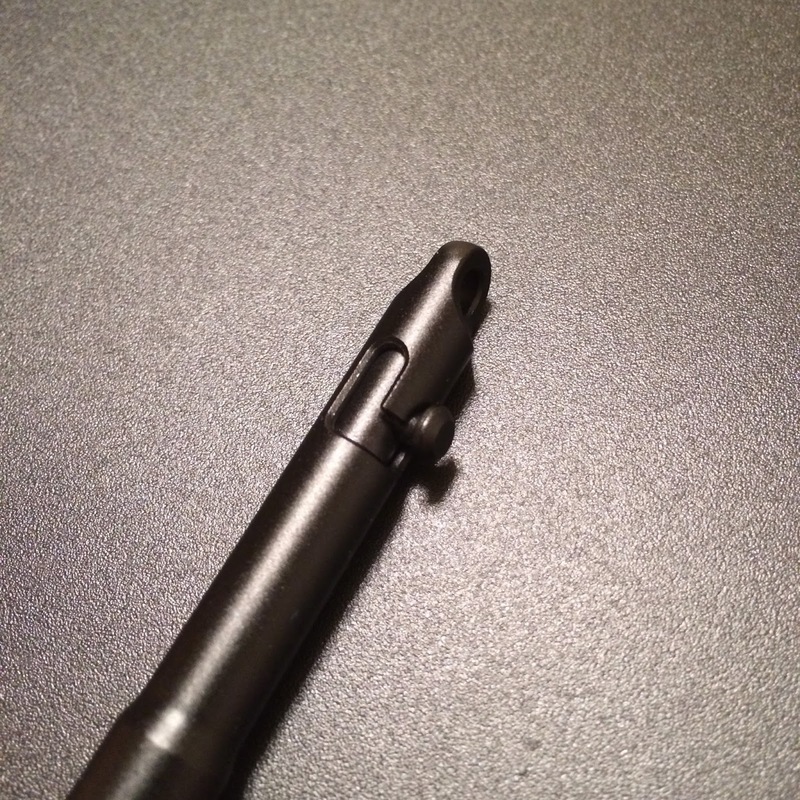 The only refill that is compatible with the Move is the Lamy M22. It's kind of an expensive refill, considering that it's half the size of a Parker-style refill and costs three times as much. But from what I've read it lasts quite a while and there are multiple ink color/tip size combos to meet whatever needs or whims you might have. 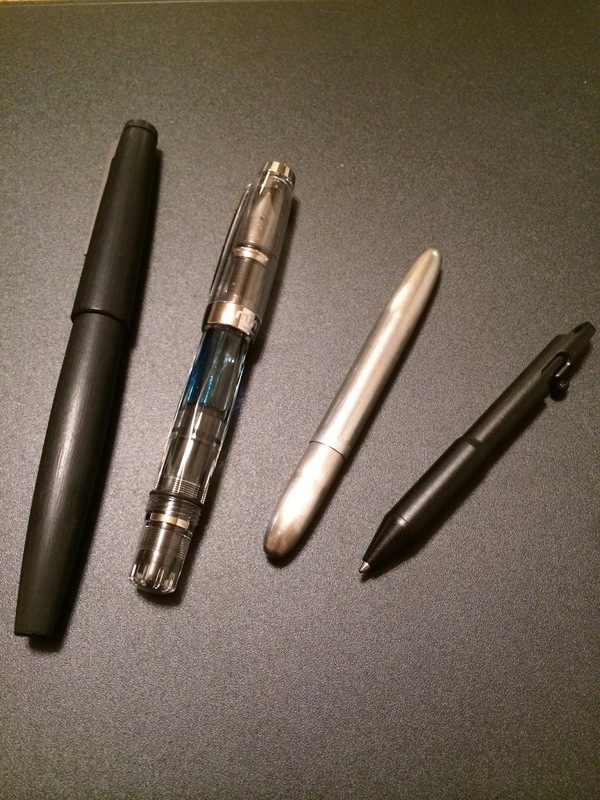 Note: I do have a theory that a Parker-style refill or something similar could be cut down, plugged, and used in the pen because the diameters and lengths look very similar: but that theory sounds pretty messy and I'm honestly not sure it's worth attempting. Maybe you're feeling brave and adventurous. A big Lamy and a little pen with Lamy juice. Other note: The spring is very small (but surprisingly robust - my fingers quickly became sore from fiddling with the bolt action so it needs broken in). And the spring is difficult to locate if you are to lose it (I lost it). It took twenty minutes of diligent searching with a flashlight to find it hiding in one of my wife's cosmetic bins. I had been looking for some Vaseline when it fell out, which brings me to the second and last problem I had with the pen. If you look in the photo with the exploded view, there is an O-ring visible at the base of the threads. The pen came with the O-ring dry, which would eventually result in the O-ring being destroyed by friction as the pen is disassembled and reassembled; and thus my search for the Vaseline. It would have been nice for the pen to come with the O-ring lubed up, but I needed to lube up my flashlight's O-ring anyway. So if you have one of these, I recommend putting some Vaseline or similar petroleum-based lubricant on it to keep the O-ring from rotting and/or getting torn up. Then it should last a good long while. Where all the action is. Overall I'm pretty impressed with this pen. It does well what it was intended to do. It's light-weight, durable, and has a rock-solid mechanism. It takes a quality refill (Lamy makes good stuff). I'm looking forward to forgetting it's in my pocket until I need it. The key ring hole is plenty large enough for any conceivable needs. I think this pen is a great contender for an EDC pen, and will probably just trade places back and forth with my KarasKustoms Retrakt for a backup pen. I'd love to get the titanium version at some point. Well done, Oliver! An EDC setup I started toying with today, partly inspired by Huckberry. I sometimes like to write. Also, I have a gear addiction.